The spirit needs – purpose, a reason for being. It needs to belong, to be loved and to live a life of meaning, integrity and benevolence if it is to discover and honour its purpose. It is by living a life based on these values that sustainable happiness, a happiness from within, can be found. This is what is meant by honouring one’s heart. The mind needs – peace, love, clarity, structure, achievable goals and objectives. It needs a clear vision/mission statement to enable it to rise up and meet life’s challenges with courage and confidence. It also needs a balance between silent reflection and positive stimulation, in order to live a life of ‘mindfulness’ and find pleasure beyond the pull of the senses. The story of health is also the story of disease, they are in fact opposite sides of the same coin. This diagram is an attempt to help the reader understand the dynamics of the self. The primary elements of the self are: Mind, Body and Spirit, and they each have their own role and functions and a deep subtle relationship to each other. All 3 interface with the environment (represented by the circle) setting up the drama we call life. Under each of the four headings are listed some of their primary needs and how they can be attained. This is not a definitive list by any means but it does help to explain or to help us understand what is needed to transform things within each aspect of the self, thereby restoring physical and/or mental health. The equilateral triangle represents the ideal state of balance and harmony between all 3, a position where the pull and tension between mind, body and spirit is opposite and equal. This means all 3 are having all their needs met and as a result are happily performing their roles and the relationship with the environment is as it ought to be, free of conflict. The triangle illustrated by the dotted lines indicates a position where health has been compromised and there begins a journey of ‘dis-ease’. This is where the self no longer relates to all its parts in an equal and opposite way. The equal force created as a result of each one’s needs being met has been lost. This ‘dis-ease’ is often, in the first instance, set up by a tension between Mind and Body (see handouts Persuading the Body 1 & 2) or by a loss of direction or purpose. This ‘dis-ease’ left unchecked will in time become disease either of a biological or psychological nature. If the body pulls the mind away from its ideals, intentions and ambitions (as it strives to get its own needs met) then the mind loses its way and the spirit is lowered as a result of this tug of war. The mind’s pursuit for excellence and the fulfilment of its ambitions can also pull against the body so that the body’s needs are neglected and this imbalance causes biological tension and often ill health and also deflates the spirit. The spirit thrives on the feeling of being at one with itself, truly at peace, happy to its core, so when there is tension in the system it suffers and so does one’s health. The lowering of spirit can manifest in different people in different ways e.g., stress, anxiety, panic, depression, phobias etc. The individual may well live in that psychological/emotional malaise for years, aware of their dysfunction yet feeling unable to change it. Equally the manifestations may be physical in nature eg: ulcers, I.B.S, lowering of one’s immune response (with the resulting health complications), central nervous system disorders etc…. These too may be spasmodic or become life long issues, depending on the individual response. Neurosis could be described as losing the self, losing a sense of control over your life whilst being aware of that, yet feeling unable to halt the demise. Psychosis on the other hand is where the individual is so bound by despair, pain, hurt etc. that one’s sense of self seems to have evaporated. It is this almost total sense of disassociation that makes working with psychosis such an enormous challenge. To be so far removed from Spirit (ones sense of value and need for a purpose) is arguably the greatest sickness of them all. Physical illness, especially when it becomes chronic in nature, can also cause a severing of the connection with the self leading to a loss of spirit, a loss of hope. 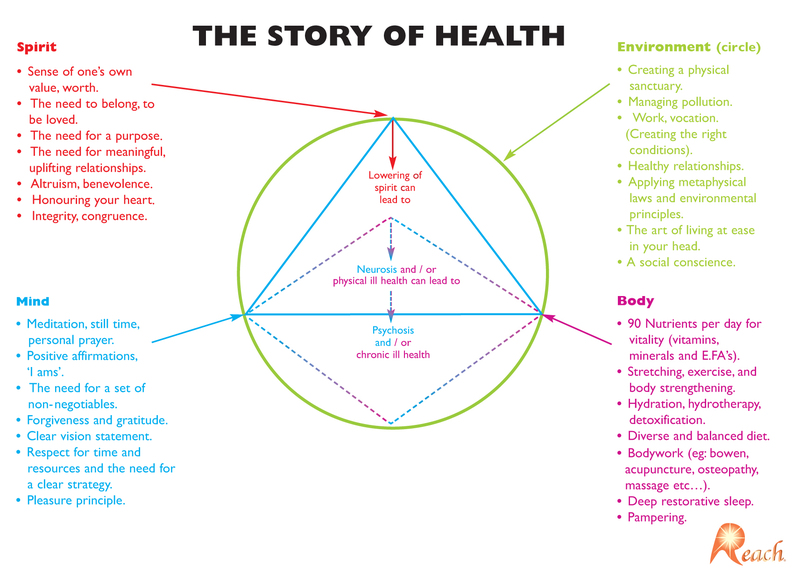 All 3 elements (Mind/Body/Spirit) are equally important in the story of health as the illustration suggests, but it is Spirit and Mind that in an ideal world would be managing and maintaining balance and harmony within the self. However, without proper respect and attention to the body’s needs and to environmental factors it is extremely difficult through will alone to stem the tide of negativity. So in order to lift oneself out of neurosis or physical challenges/ill health and avoid the ‘trap door’ which leads to psychosis and/or chronic health issues we need to respond systematically, and creatively to our biological and environmental needs. Then the mind will be able to fulfil its highest ideals and ambitions and the spirit will rise up and be able to pursue a life of value, meaning and purpose. “To keep the body in good health is a duty…otherwise we shall not be able to keep our minds strong and clear”. Hopefully what you will have learnt from the original handout is the importance of the relationship between mind, body, spirit and environment. The relationship between these four aspects underpins the whole of human life. Without their synergy, well-being and happiness are no more than fleeting experiences. Their relationship is deep, subtle and multi-factorial and in this handout we will further explore those subtleties and intricacies. Although the mind and spirit are arguably the key players in this synergistic dance, the truth is without the needs of the body being met and the environment being right, the mind and spirit eternally struggle to prosper. A wonderful analogy for understanding the concept of the relationship between the four is to imagine a table with four legs. Which leg is most important? By conceptualizing a table with four legs it becomes clear that all are of equal importance and should be appropriately positioned and equal in size. In the same way, the table of the self cannot be balanced, stable and able to fulfill it’s potential if the mind, body, spirit and environment are not all equally tended to and respected. In order to create balance and stability in your life, one often needs to begin the process of transformation by initially focusing on the body and the environment. These two are most likely to be undermining and limiting your growth and we would encourage you to look in these two areas first. If the body is not having its needs met (see Persuading the Body 1, 2 and 3) then it will continue to work against the mind and limit the growth of the spirit and so the needs of the body must not be neglected. Equally, if your environment does not offer you a sanctuary, a genuine place of safety and retreat, then once again both mind and spirit will limp along in a dysfunctional way. Your environment needs orderliness to foster growth in the other three aspects of the self so it is important to get colours, fragrances and aesthetics right in your personal space. It is also important to understand and develop the other aspects of environment (see Spirit Mind Body Plan and Spirit Mind Body and Environment). So although we would stress that all four are equally important we would want this conundrum to be understood. The paradox being that almost certainly the process of personal transformation will be best achieved by making any necessary biological and environmental changes first. This way the mind and spirit are propelled forwards and the tensions particularly between mind and body are removed. If the biological and environmental needs are not addressed they become a gale force wind blowing against one’s ambitions and aspirations. In order for that gale force wind to be blowing at your back, try meeting the needs of your body and sculpt your environment to suit you, then your progress will be swift and smooth. By understanding the deep and subtle relationship between spirit, mind, body and environment the keys to your happiness lie in the palm of your hand. So plan the changes you need to make and make them as quickly as you can. Take back responsibility for you. However you’ve arrived at your current position in life, remember you cannot change the past but you can change the way it affects you! It’s time for change and change begins with you! The Story of Health series is the most important of our handouts because it begins to pull together all the other hundreds of handouts and resources we have produced. As unashamed, holistic integrationists we believe the vast and complex subject of the human condition can be quite easily understood when we stop worshipping at only one altar of knowledge. There are so many self-proclaimed ‘Holy Grails’ offering the answer to our prayers’. They claim to provide us with the ‘missing link’ that will complete our chain of misunderstanding and enable us to understand what has so far been beyond our grasp. Rarely is that true. The many systems of knowledge offering us countless explanations have, in the main, helped to serve up more confusion than clarity! There is too much ego and posturing as each stands steadfast in its perspective, each failing to see the bigger picture. The truth is only really found when we bring about a dialogue between the different bodies of knowledge and their many insights. It’s not in the alleged differences that the jigsaw puzzle of life is understood, it is at the points of merger, the points where the information actually fits together. When you take the competition out of the pursuit for clarity and truth and replace it with co-operation, a different picture emerges – one that begins to make sense! Go back to The Story of Health and really study and reflect on its contents and you will find it answers so many of those unanswered questions. It explains why we keep stumbling in our pursuit for wellbeing and happiness. Probably most of all it explains the inter-connectedness of our lives, which is why if we are to worship at any altar let it be where knowledge does not compete, but where it co-operates. Let us explore this interconnectedness and need for co-operation further with a few examples. Did you know that a 2% reduction in your water consumption can lead to up to a 50% reduction in your concentration and performance? So the impact on the body directly affects the mind. This reduction in concentration and performance also changes the way you feel about yourself, therefore impacting on the spirit. So body, mind and spirit are all affected by your water intake! Did you know that one of the biggest causes of stress, anxiety and depression is a life without meaning and purpose? When this spiritual need is not met it cuts us off from a sense of being part of something, a sense of belonging. The consequences on the mind and body are staggering. When we live in a place of such stress a cascade of chemical messengers (neuropeptides, hormones and neurotransmitters) flood the blood stream via the pituitary gland. These messengers in turn carry the negative message body-wide, literally impacting on every cell, system and organ. This ‘toxic flooding’ of the body not only undermines our physical health, it spoils and corrupts our thinking. So once again spirit, body and mind impact on one another. Did you know that when the organs of detoxification, the colon, liver, lungs, skin, lymph glands, kidneys etc., are ‘bunged up’ with waste they are unable to keep the pathways for health clear and endotoxicity (poisoning of the system) ensues. Endotoxicity contaminates the blood and once this has taken place in the body, nothing escapes. As the blood passes through the brain (the seat of consciousness) all our mental faculties are affected, especially perception, memory, self esteem, concentration and feelings. This distortion in consciousness leads to doubts, fear and paranoia and the spirit again loses its way. Did you know that there is more pollution to be found in your home than in the environment at large?There are literally countless offenders – dust mites, bed bugs, xenooestrogens (chemicals that act on our bodies like oestrogen – found in carpets, paints, plastics etc. ), innumerable pathogens (bacteria, parasites, fungi, viruses etc.) The list goes on. These substances can ravage our bodies, compromising our health and sense of wellbeing. If our immune systems are not strong and vigilant we simply become victims of an invisible, undermining force, which in turn robs us ultimately of peace and contentment. Again we lose on all fronts. Hopefully by now the pattern is clear, anything affecting one part of the organism affects everything else. This is why our answers can only really be found in synergy. It is a synergistic answer that will offer us a solution that we can sustain. Just think how it is for the person who properly hydrates daily, who has developed a life of meaning and purpose, who knows where he/she is going. One who drives the process of detoxification, ensuring all pathways to health are clear, who manages the pollution in their environment ensuring the threats to health are kept to a minimum, imagine how much better their reality must be compared to those who are pursing only one or two of these activities . Could their moods, perception, concentration, confidence, general health etc. be the same? i) If you create a sanctuary (listed under environment), a place where you can be still, reflect and be positive, then your mind can become increasingly focused on those things that enhance your sense of value and worth. This in turn lifts your spirits and the body becomes a wonderful reservoir for all those ‘healing hormones’ that create a bio-chemical high. Such a sanctuary draws you to itself time and time again, to further enjoy the gifts of silent, positive reflection. ii) Without the 90 nutrients (60 minerals, 16 vitamins, 11 amino acids, 3 essential fatty acids– listed under body) we need every day, our bodies go into a place of panic and self preservation. This means the perceived threat of malnourishment causes the body to work against the mind in its own self-interest. A battle ensues as the body cries out for the fuel to perform the countless tasks it is responsible for. As is always the case, the spirit then pays the price. iii) A life of benevolence and altruism (as listed under spirit) offers rich rewards, not because one seeks them but because to give without desire for the self is to receive. The person who gives in this way finds the mind is drenched in peace. That peace is like the oil that keeps the flame of contentment and wellbeing burning deep within. The body inhales this wonderful fragrance producing the joyous gift of health. If one understands and then pursues the story of health, the gift of wisdom and with it the highest prize, peace and contentment, will be achieved. The brief illustrations contained in this handout are further pieces of the jigsaw. We hope they will help you to better understand the depth and significance of The Story of Health. We believe it is the key to your health and happiness. Why not embrace it and make it yours!